With the cold weather likely impacting your motivation, it can be hard to get up the energy to cook during the week. Meal planning can be an easy and time saving solution. What better time of year to put that crock pot to use for some warm comforting meals! 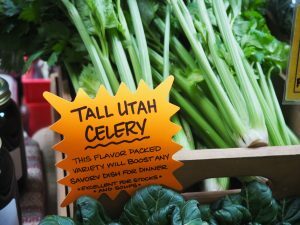 So how do you plan for fresh meals during the winter months when local in-season produce doesn’t feel as accessible? Head to your local winter farmers market and see what you can find! Be open to trying new things and looking for recipes based off what is available. Think about what you might like to try and cook with. There are many things that you may not have liked in the past but are maybe open to trying in a different way now. Hate horseradish? Try a creamy cauliflower and horseradish soup. Ever heard of salsify (or oyster plant)? It was popular with the victorians but fell out of fashion in the 20th century. Would you be open to trying different spices? Spices are a great way to add flavor and complexity to a dish. You may wonder if it will be expensive to buy in bulk and make meals ahead of time. The good news is that it is usually easier to buy items in bulk at the market, especially when they are in season. Also, the great thing about crockpot meals is that you can make a lot of food at once and refrigerate or freeze to eat later on in the week, saving money by not buying take-out at the last minute. Think of a day in the week that you may be able to set aside some time to prep and cook meals ahead so that you can come home from work and not have to worry about cooking a meal. You can simply reheat the meal that you have already prepped in advance!